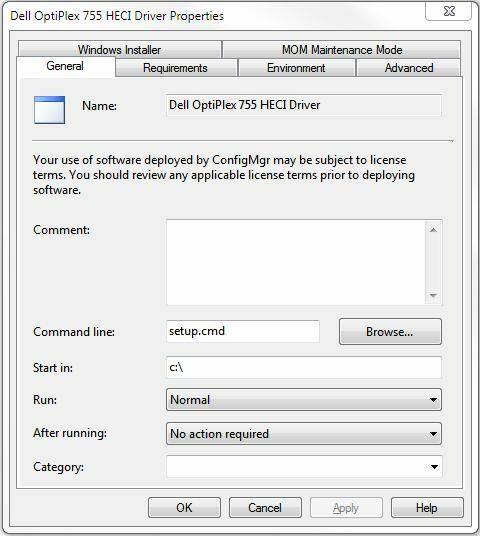 This post describes how I deployed the Intel AMT/HECI/SOL Drivers using System Center Configuration Manager (SCCM). I was deploying the drivers to Dell OptiPlex desktops and Latitude laptops, so I downloaded the drivers from http://support.euro.dell.com/ . The drivers download as compressed files, so I extract them using 7-zip http://www.7-zip.org/. This leaves you with a set of files like those below. In the screenshot above you’ll see setup.cmd batch file. This is the secret to deploying the drivers using SCCM. The Intel documentation states that you can run setup.exe -s to silently install the drivers. However, when I created a software distribution package and set it to run setup.exe -s the drivers never installed and the installer routine exited due to an invalid command option. What you need to do is create a batch file which calls setup.exe -s and point the software package as the batch file, e.g. This entry was posted in System Center Configuration Manger on January 27, 2012 by richardstk.